JOHN WARHURST. Mud-wrestling the Catholic elephant. This article was first published on Eureka Street. 4 Responses to JOHN WARHURST. 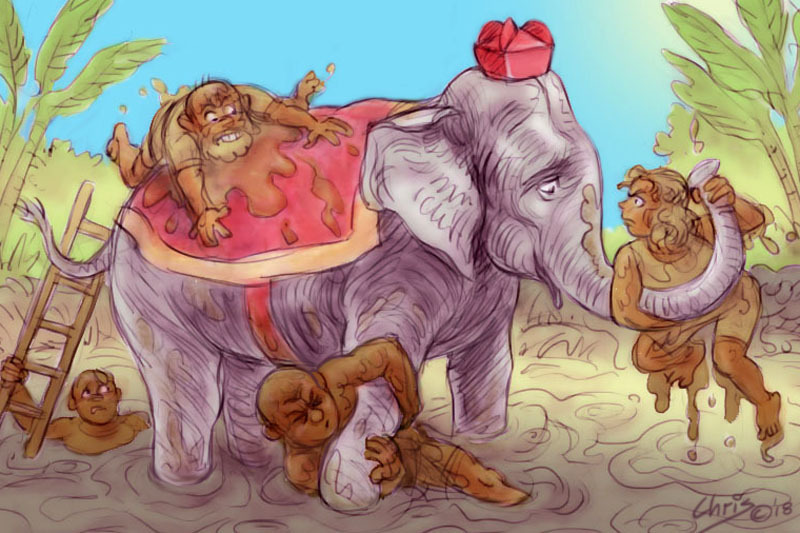 Mud-wrestling the Catholic elephant. Perhaps the many, many of us who do still care need to ask the veil-tearing, familiar, but too infrequently asked question: “What would Jesus do?” None of us can speak for him with any absolute authority (let’s set that delusion aside!). However, we can look at his example, especially the example of his own conduct and his imploring to the people around him that their own attitudes and conduct choices would reflect dignity and compassion and meaningful care. Nothing else. Then the answers become simple. We look to the margins – and into the heart of our own lives. We refuse to be intimidated, especially by institutional power that is consuming itself and exhausts us. We instead empower OURSELVES through our daily practice of conscious living, through our spiritual companionships, through Divine and constant inspiration. We attempt each in our own way to bring to life the transformative power of unconditional inclusion, unconditional care for others, unconditional trust in the goodness of God. We empower ourselves towards gratitude for this astonishing world: and protect it. We co-create with a loving, forgiving God to the very best of our ability in whatever spheres we’ve been called to. We re-read the Beatitudes! We forgive ourselves for our own idiocies. And we remember, with Thomas Merton on that day in 1958 on the corner of Fourth and Walnut, that each one of us is – if only we could know and trust it – walking around SHINING LIKE THE SUN! I want to add a PS: that coming together in meditation or at any service which brings genuine good will and love for humanity, God, ourselves – and it may well be at your local church, synagogue or mosque, despite “institutional power” – surely goes a very long way to re-membering, and re-encouraging. “Where 2 or 3 are gathered together, there I am (said Jesus, loving and not judging us)…” And with Paul: “It is not I who lives, but Christ who lives in me…” Whew! Dare we even think about this?!! Great institutions wield a mighty version of power…there are, thank heaven, so many others. Stephanie, what a wonderful comment and so insightful. I have struggled over recent days with my faith in the Catholic Church; its Pope who says much but does little, its cardinals who question the Pope’s initiative and the bishops who just cant seem to think independently of the system. Reform? : 500 years after Martin Luther; what are the odds? Thank you for this clear and thoughtful article. In an age where increasing complexity (and a maturing consciousness) is not reflected in public life or some parishes, it is important to try and navigate a system, and develop structures, that lift the bar into this emerging societal complexity & maturity. Trying to change a monarchical structure and system (Institutional Church) into a system of matrices (‘matrix’ plural) is fundamental to engaging with, and attending to, contemporary issues and needs. I’m just not sure how it can happen unless training of nuns and priests is undertaken within a matrix paradigm. It’s REALLY hard work being accountable in a matrix relationship and way of being in the world … but it is absolutely an essential skill for what is being asked in this time of a civilisation transition. This is where blended families with healthy relationships really come into their own … for ‘matrix’ systems are engaged with in everyday life in these family structures, and beyond. They have so much to teach others about living life in mature and responsible ways at this point in history. In these families, nothing is either/or … needs are attended to within a diverse and moderating way. In both my own personal and professional life, I’ve lived out this reality and have seen transformations birthed and nourished from its nexus. Unfortunately, societal and church structures and systems in place (STILL) do not support this way of being in the world; something desperately needed to transition well into the future. Co-leadership is foundational and a good place to start.